Coming into the 2018-19 season, expectations were high for Jake DeBrusk. After an impressive rookie campaign, the former first-round pick was expected to make the Bruins second line a strength. Through 54 games, DeBrusk has only 18 points after recording 43 last season. His struggles in a way represent the Bruins team as a whole. If they hope to make a deep playoff run, then the offense will need to improve. There are many options on the trade market, but getting DeBrusk on track will be key regardless of if the Bruins make a move. Over the Bruins’ last 10 games, DeBrusk has only recorded two points. In January he struggled tremendously and only had one multi-point game. So far he has yet to show the dynamic scoring touch that was on full display in last year’s playoffs. While DeBrusk is averaging more ice time in his second season, that has not improved his numbers. But it’s not time to give up on the young winger. Part of DeBrusk’s struggles is due to a revolving door on the second line. David Krejci has been solid as always, while wingers such as Joakim Nordstrom, Ryan Donato, and Danton Heinen have struggled. It is hard to form chemistry on a line that is constantly changing. That is why adding a proven scorer to the Bruins second line is crucial. 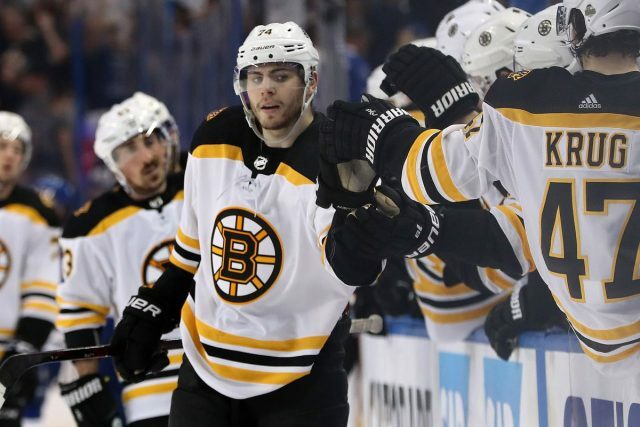 It could help DeBrusk break out of the sophomore slump that has been magnified due to the Bruins lack of scoring depth. Despite the former first-round pick’s uneven season, he is still vital to the Bruins’ success. DeBrusk’s lack of offense is not due to a decrease in chances; he already has 108 shots on net this season. While he ranks fourth in goals on the Bruins, he has not scored in over a month. DeBrusk has been effective on the man advantage with five goals after only having two last season. The area he has struggled in the most has been creating offense. Last season DeBrusk had a faceoff percentage of over 44 percent. Through 45 games this season that has dropped to 21 percent. The former first-round pick has also been incredibly streaky and at times non-existent. After recording 27 assists as a rookie, he has only five this season. He does, however, still have the ability to carry this team. "I have a lot of expectations for myself. You look at points or statistics, I only have five assists. It’s after the All-Star break and to be honest, it’s pretty embarrassing." What made Debrusk so impressive as a rookie was his ability to step up in big moments. In the playoffs whenever the Bruins needed a goal DeBrusk delivered, rare for a rookie. No stage seemed too big and the Edmonton native thrived in the spotlight. That is the player this team will need as they try to secure a playoff spot. With the regular season winding down each game will become more important. Points will be at a premium, and the Bruins must be at their best. That means their young players will have to step up regardless of their struggles so far this season. For DeBrusk this is the time where he should thrive. His play could determine how far this team goes and how dangerous the Bruins second line is.